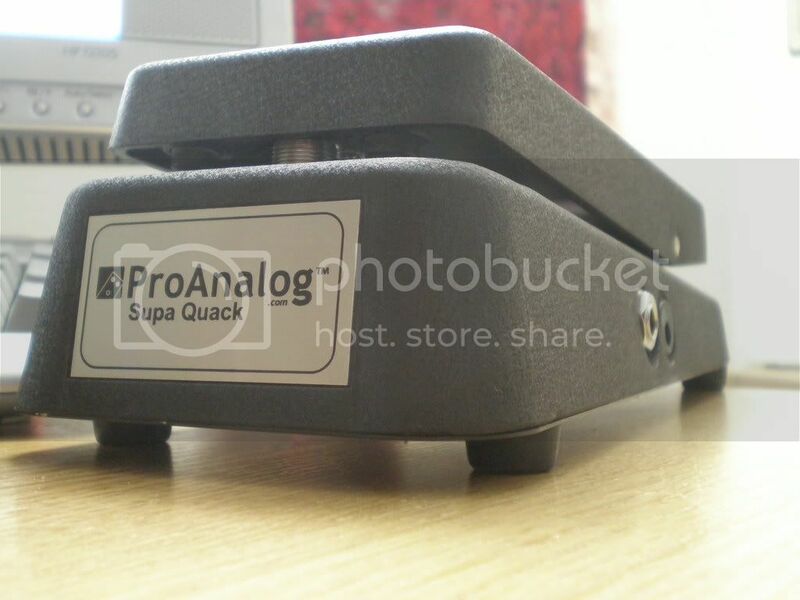 Pro Analog Supa Quack Wah- My Thoughts. 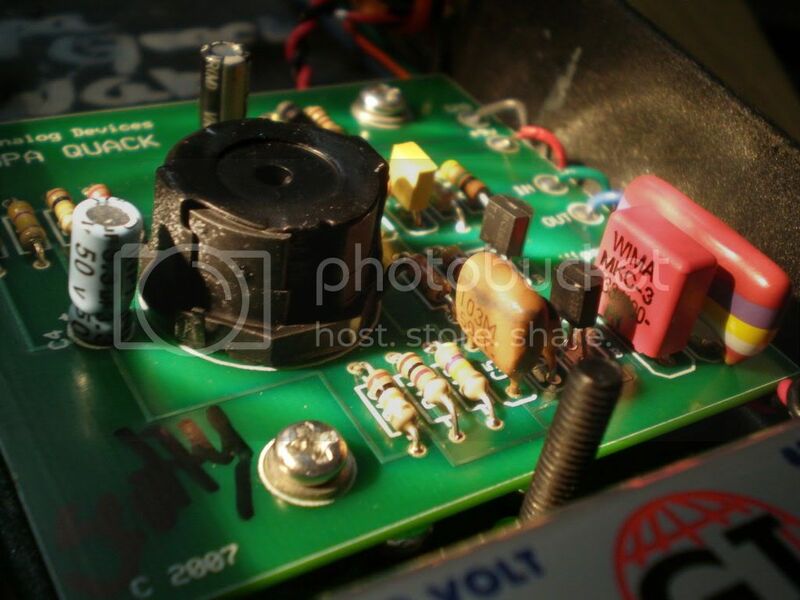 Discussion in 'Effects, Pedals, Strings & Things' started by markom89, May 9, 2008. I scored a virtually brand new Supa Quack wah on here last week in a trade from TGP member "leumasjames" (props, Sam!) and just got it a few hours ago from the mailman. Below are my thoughts on the pedal, incase anyone is interested. I exchanged a few e-mails with Scotty last week seeking details on my "new" wah. He said that he just built it a few weeks ago and that it was one of the best ones he made using all the good NOS parts and what not. As you'll see in the below pictures it's in one of the black cases and has a very stealthy look to it. I dig it. The build quality of this thing is phenomenal- atleast compared to some other wahs that I've tried over the years. As you'll see, all the parts are top quaity from the tropical fish caps to the Wima parts. I know that probably wasn't the best review, but I tried. If anyone has any questions, please feel free to ask me and I'll do my best to answer them! I'm gonna' do some clips of this thing later on in the week, but for now I'm gonna' go play it some more Hope you guys found my review helpful! Crap. Now I want to try one. These babies are pretty pricey, though, right? Long wait time? Paul, yeah, they're pretty pricey at $400, I guess (though not as pricey as some other wahs)... as for the wait... I've heard it's quite long (like up to a year), but I'm no expert... Best to contact Scotty! He's a very nice guy. Sorry I gave you GAS NOT!!! Cool, well maybe I'll get on the list and try to forget about it. It's the actual tonal sweep that I speak of. Physical sweep is perfect. jeebus! four beans for a wah. . . i never would have thunk it. . . good thing i love my buddha. . .i used to think THAT was a lot of money for a wah. . . .
Yeah, it's a pricey pedal, but like I said, I got it in a trade (and still got $150 ontop of it), so I didn't actually pay the full price or anything like that. Also, I don't know how I would wait a year for a wah! haha. I just played it and it just sounds so great... the more I play it the less I notice the limited sweep as you learn to work with the sweep Scotty has allowed and it's just totally great. I've used it with all my fuzzes now and works equally great with each one- even my WILDEST and most spittiest fuzz- the Dirty Boy Fuzzy Boy... That's saying something, IMO!!! Also, I'm really digging the "stealth" look it has. These wahs are ridiculously well built, too.